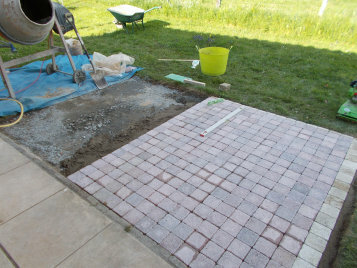 When we ordered the pallet of pinky-blue concrete setts for the drive edging, we had a plan for the ones left over. Our terrace at the back of the house is great for breakfast, but it gets a bit crowded and we do need some shade. So the next project is.... a terrace extension. We decided to do this project ourselves - the very last project ever. No more after this. Ever. We barrowed the 'tout venant' rocks/stones/grit mixture from where it had been dumped in a builders bag in the front garden, raked it in the hole and whacked it solid. 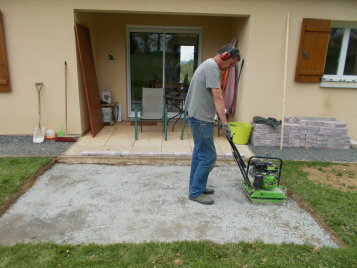 The cement mixer made a final appearance and while Tony mixed up, I got down on my complaining knees and laid the setts, carefully levelling every one. We (royal We) started by digging out to 18cm deep, aided by worm-seeking chickens and cat. The turf and soil was distributed around the garden in all the dips and hollows, to be grass-seeded later. It took two afternoons and I ached for two days afterwards, but it looks fab finished with fine white sand brushed into the joints. Note the light grey setts around the edge, to match the grey edges of the path and terraces elsewhere in the garden. We don't just throw this together! Stage one of project completed.